The Tuesdays with Dorie group has been active for years, originally working their way through Baking: From My Home to Yours. I’ve been following their progress and am a longtime fan of Greenspan ’s writing– so when I heard the group was starting fresh, I jumped aboard. I’m excited about the book – which is divided roughly equally between breads and sweets, and weaves together recipes from some of the best bakers of its era, through Greenspan’s writing. And I love the format of the challenge; two posts a month, each hosted by two bloggers; only the official hosts post the recipe for any given challenge. 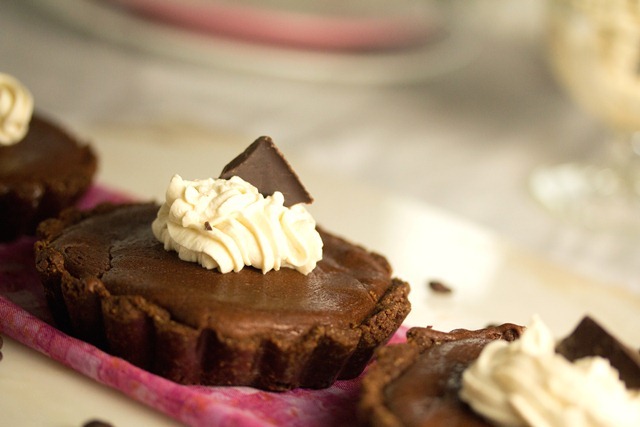 Our sweet challenge this month is David Ogonowski‘s Chocolate Truffle Tartlets: a chocolate crust filled with biscotti, chunks of milk and white chocolate and surrounded by a bittersweet chocolate filling. 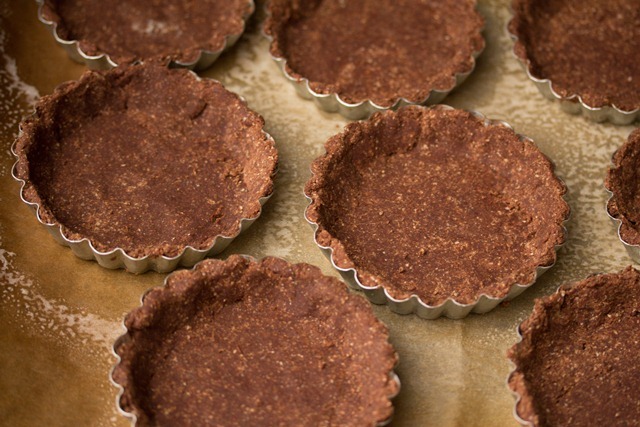 Of course, my tartlets are a little different: I made my crust by hand with a blend of whole wheat pastry dough and all-purpose flour, and my tarts were filled with cocoa-nibs and large crumbs of the extra crust batter that I pre-baked. I made 8-3 ½ inch tarts, and next time (oh yes, there will be a next time! ), I’ll go even smaller – maybe something the size of an actual truffle – they’re that luxurious. 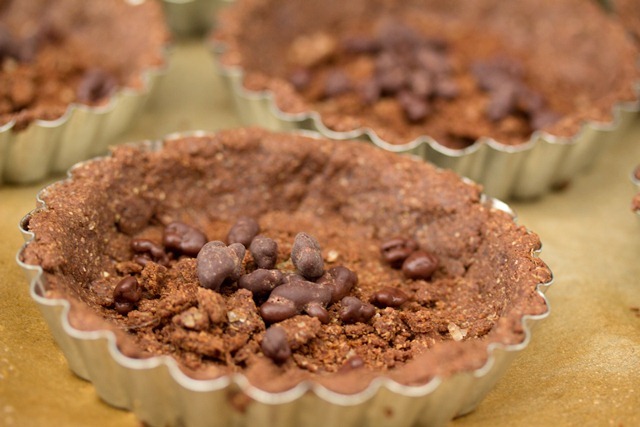 Visit the blogs of our hosts for this round, Steph, Spike, Jamie and Jessica to see the recipe (and four more tarts!). But I warn you, you’ll be tempted to start baking too. Not long ago, I finished reading As Always, Julia, an edited selection of Julia Child’s correspondence with Avis De Voto – the woman who was in every practical way, her agent. The sheer voyeuristic pleasure of reading the long detailed letters, (in addition to all the ins and out of many of the recipes that went into creating the first volume of Mastering the Art of French Cooking, the letters also bring the political anguish of the McCarthy years vividly to life) quickly gives way to admiration for Julia Child’s sheer strength of will – and her intelligence. Working for more than 10 years on such a project, didn’t always feel like a luxury, but what a gift it turned out to be for American food culture. Watching the truffle tartlets episode on youtube made me a little sad. Julia was 84, in 1996, and though now an icon, she is no longer a dazzling presence. I admire the fact that she chose not to take on the book project, but to pass the torch to a worthy successor: Dorie Greenspan. Given her character that act must have been every bit as much a challenge, as a luxury. Oh, I loved As Always Julia! I read it some time last year. 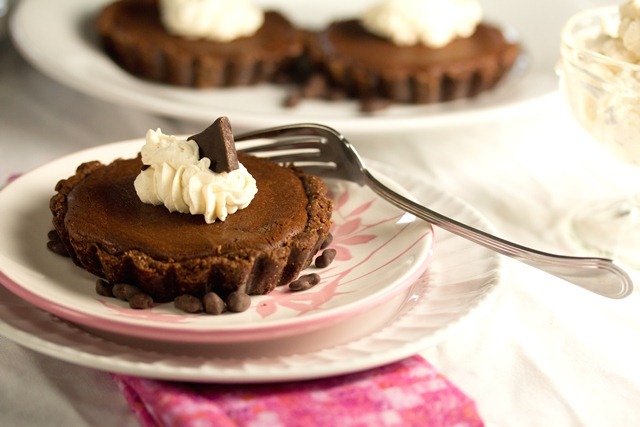 Your tarts look wonderful! Welcome to the group, you are up to the challenge. Your tarts look great! Nice photos. I love the idea of making them bite-sized. That’s about all I could eat a one time anyway! Pretty, pretty, pretty! Thanks for finding me on Twitter. Glad to have found your blog.